What are your holiday email marketing plans? According to marketing analytics company, Custora, email marketing was the number one driver of sales on Black Friday 2014, resulting in 27.3 percent of online sales. Whether you’re gearing up for the big shopping days at the start of the holiday season — like Black Friday (November 27), Small Business Saturday (November 28), Cyber Monday (November 30) or Giving Tuesday (December 1) — or looking to drive sales into the New Year, the right email marketing plan can make a world of difference. While you may not have all your plans finalized, or even started at this point, you know that the next couple months are going to go fast and the season will be here before you know it. 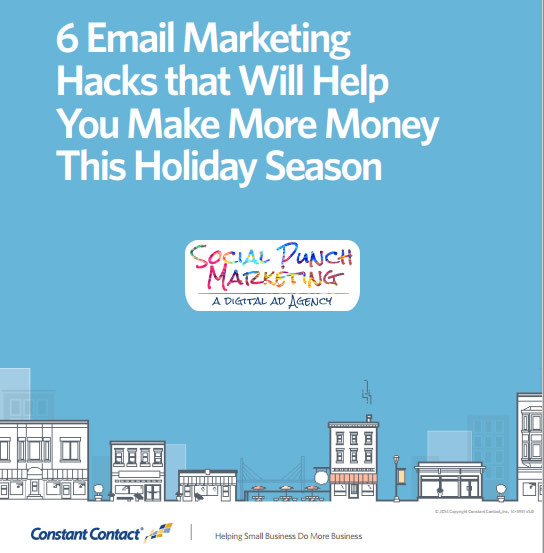 Check out this free email marketing guide to help you plan your holiday season. Personalize your emails to targeted custom lists of customers. Be Mobile Friendly. 53 percent of consumers who shopped online last holiday season did so on a smartphone or tablet. Invest in your Subject Line – it is the key element that dictates whether or not your email will be opened – make it a good one. Incorporate Social Media – Save time and expand the possibility of reaching your customers by sharing your emails on Social Media. Automate your messaging – Do the work now, before the holiday craze, so you can be sure your messages get out using automated tools with Constant Contact. Don’t have time – we can do all of these step for you! Give us a shout and contact us!